You shouldn’t be Investing if you don’t know these 2 basics rules! You shouldn’t be Investing if you don’t know these 2 basics rules! You shouldn’t be Investing if you don’t know these 2 basics rules! All of us have different reasons as to why we started investing. Some of you might have read my previous article on “3 Reasons To Start Investing… NOW!” and in it, I mentioned about compound interest. I quote Albert Einstein, “Compound interest is the 8th wonder of the world. He who understands it, earns it… He who doesn’t… pays it.” But still, I don’t think many of us, especially those who are new to investing, understands the power of compound interest. It actually makes a huge difference to your investing goals. It can be the difference between becoming a millionaire today or 6 years later. Before I dive into the details, let’s start with a small quiz and see if you will change your answer at the end of this article. If you are putting your money somewhere where you wished it will grow over time, this is the first rule that you should know. It’s a very simple rule. Basically, the rule of 72 estimates the amount of time required for you to double your money, with compound interest factored in. All you need to do is to take 72 and divide it with the annual rate of return. Say, for example, you buy a stock hoping for a 8% rate of return yearly. This will take you 72/8 = 9 years to double your money. If you started in 2017 with S$5,000, in 2026 that $5,000 would have grown to $10,000. 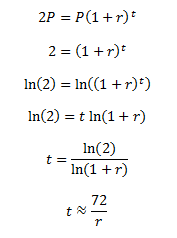 And if you are a Math Junkie, here’s how the formula was derived. There are analysis errors in this formula which I will not go into, but if your interest rate is between 6% to 10% you may use the rule of 72 safely. Below 5% there may be a 0.6-1 year error and above 10%, it is roughly about 0.3 years error. But heck, 72 is good enough. After all, you just want to know roughly how long will it take to double your money. But here’s the thing, after explaining so much, you might say, “Ok, so what? How is compound interest so powerful?” Now, you’ll see the magic. Back to the question I asked at the start of this article, 3% or 4%. Apply rule 72 now. 72/3 = 24 years. 72/4 = 18 years. Do you see it? For just 1% difference in interest rate, it takes you 6 years longer to double your money. This is the main reason why interest rates are always a hot topic. And remember, the rule of 72 doesn’t just apply to the growth of your money. It can be used during an inflation. If the interest rates go up by 6% a year, how long will it be before your money if worth half the value it is today? 72/6 = roughly 12 years. And even outside of the financial world, say you have 500 Facebook friends and you add 1 new friend a day. How long will it be before you double the number of friends you have? Or if the population growth rate of a country is x%, how long will it take for the population to double? Phew. We are through with the difficult part. Hope you understand the power of compound interest now and why Albert Einstein said it’s the 8th Wonder of the world. Up next is a simple rule that you may use to check the amount of money you should invest in stocks. The Rule of 100 states that the percentage of stocks you should hold in your portfolio is 100 minus your age. So if you are 24 years old, 76% of your total investments should be in stocks and 24% in less risky assets. Read it carefully, it’s not 76% of the total money you have. It’s 76% of the money you have to invest. And if you’re 50 years old, only 50% of your total investments should be in stocks. The remaining 50% should be in safer asset classes. This is probably the best way to balance your portfolio and prepare for retirement. The only mistake one can probably make when using this rule is determining what is safe and what is not. Well, that depends on your risk appetite. If you were to research deeper into this rule, many people have modified it to the rule of 110 or even 120. It’s simple to understand why. With the advancement of medical technology, people tend to live longer hence extending the number. Retirement age is also being extended. We used to retire at 55, now its 67. But again, lets keep it simple. We can just use 100. I’m never a fan of sticking 100% to a rule but I guess these can be guidelines as we start our investment journey. YES, I WANT TO START INVESTING!